With the recent tragic and untimely passing of our dearest Rebbetzin, Rashi Minkowicz OBM, much has transpired in our community. This email is an update, specifically addressing our building campaign ILLUMINATION. Prior to last week our community had raised approximately $1 million towards a $3.5m goal for a new campus. As was announced at the memorial event, with the amazing work of Mendel & Yoel Minkowicz, we have been given a tremendous opportunity to finally build a permanent home for Chabad where Rashi's legacy can continue to live on. Shortly after their mother’s passing, Mendel and Yoel Minkowicz independently launched their own campaign to raise the balance of funds to complete this project in their mother's honor. With the help of a long time school friend, they developed a website and a new campaign was launched via www.rashiscampus.com. 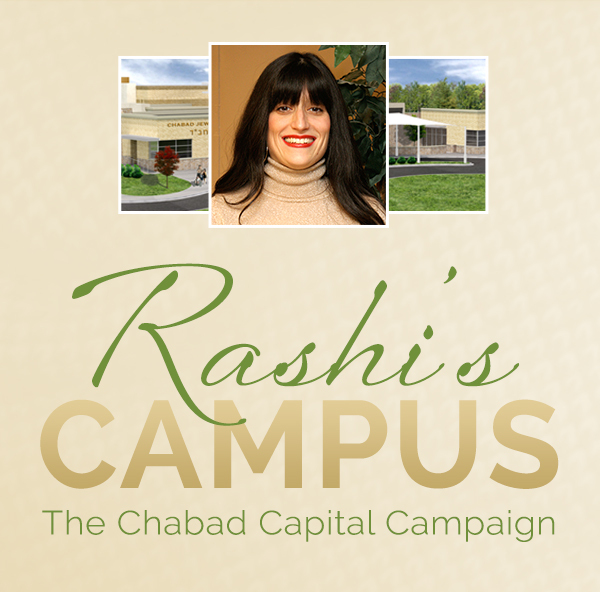 Going forward the original Illumination campaign and the new campaign started by Mendel will be consolidated into one and will now officially be re-launched as RASHI’S CAMPUS. • The overall fundraising target will be raised from $3.5 million to $4 million with the surplus funds to be used to eliminate Chabad of North Fulton’s existing mortgage debt. • The donors reserve naming rights to the general campus and intend to name it RASHI’S CAMPUS. This generous grant enables Chabad of North Fulton to be in a position of realizing our dream and finally build a center where Rashi's legacy can continue to flourish. The grant also enables us to move forward free of any debt or other long term financial obligations. Since announcing this grant, funds have been forthcoming at a healthy pace and we are presently less than $1.4 million away from our new $4 million goal. Our goal is to raise the $1.4 million, in either single contributions, or multi-year pledges over the next few months and proceed to groundbreaking as soon as possible. This is a very realistic and manageable goal, and with YOUR participation we expect to achieve it in the very near future. As previously communicated the site plan has already been prepared and building plans are close to completion. Once we have funds or pledges in place construction will commence. Pledges can be made payable over any period up to 5 years, and every contribution, over any period, will be matched and helps us reach that goal. For example, a $5,000 pledge payable over five years is $83 per month. Contributions and pledges can be made at www.chabadnf.org/campaign. In addition to pledges and donations, we are looking for a few more dedicated volunteers to assist us with solicitations. We are also seeking the assistance of a marketing expert to assist our campaign. If you are willing to volunteer please respond to this email at campaign@chabadnf.org. Let us come together on this deeply meaningful project in honor of Rashi Minkowicz, OBM. With your help and Hashem's blessing we can realize this dream for all of us.